Banana Walnut Granola | Naturally. This year, Mother’s day is taking on a bit of a new meaning for me since I’ve hit the point where this babe could come any day. It is about every emotion I could possibly feel rolled into one and I know that after he’s born, those emotions will only intensify. Luckily I have had so many wonderful examples set in my life of strong, amazing women that I’m really excited to take my own journey as a mother. Again this year for Mother’s day, I’m partnering with Fair trade USA to honor a few more amazing women who are mother’s and benefit from earning wages through Fair Trade. They’ve partnered me with two women, Carmen Ortega and Jennifer Coronel who are supporting their children by working at a packaging plant for Cerro Azul (an association of banana producers). You can read more about them and other amazing women on the Fair Trade USA website. Remove banana from peel and place in the bowl of a stand mixer. Add coconut oil, maple syrup, cinnamon, and sea salt. Mix on medium-high until mixture comes together a bit. Add the 3 cups of oats and let mix on medium-low until oats are covered. Toss in walnuts, mixing and adding a few more oats until granola comes together and clumps. Scrap out onto at least two baking trays covered with parchment paper and return to 400˚ oven. Bake for 10 minutes then break apart granola and flip the browning pieces inwards as needed. Bake for another 10 to 15 minutes until banana is golden. Turn off the oven and allow the granola to sit for another 15 minutes (or more) to continue to crisp. 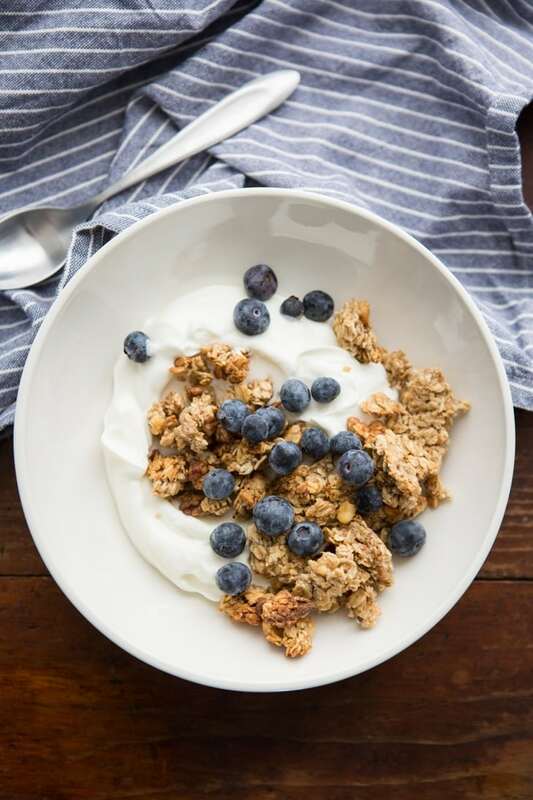 If you find your granola is still soft after cooling outside the oven, return to a 300˚ oven until the moisture is gone. This granola is a bit finicky, so don’t be afraid to let it sit in the oven at cooler temperatures until it’s dried out (any wet granola won’t keep). Also, if you notice some clumps that are browning and crisp, feel free to remove those from the pan an set aside. I promise this hands on attention is worth it! I love the texture of clumpy granola, and the flavour combination of maple and bananas is one of my favourites. I’ll have to give it a try next time I have barely-ripe bananas (how important is it that they’re actually barely ripe?). And I love the stories of the fair trade workers you’re showcasing. Not super important- just helps them not turn to extreme liquid will roasting! I like your partnership with Fair Trade USA, and I love the clumpy in this granola. I just happen to be making granola today for a friend who is a new mom. I think new moms (or any mom for that matter) would appreciate this granola as a Mother’s Day gift. I’m so excited to try this recipe! Granola is a pantry staple in our home, the clumpier the better. I’ve yet to make a banana variety, so I’m looking forward to this! Thank you Erin! And happy, early, Mother’s day! It looks wonderful. And I love that you are partnering with Fair Trade USA. I lurve me some banana granola! It’s addictive! I have loved reading these mothers day posts! Also, this is the master of chunk as far as granolas go. Well done! This sounds (and looks) like a yummy granola recipe. Wishing you happy mother’s day in advance. Cheers! Healthy and delicious. I need to start paying more attention to my breakfasts. I absolutely love homemade granola; this looks fabulous!!! Can’t wait to try. Is there any other oil I can use instead of coconut oil? I traditionally use an oil like walnut or even grapeseed. Fantastic recipe! 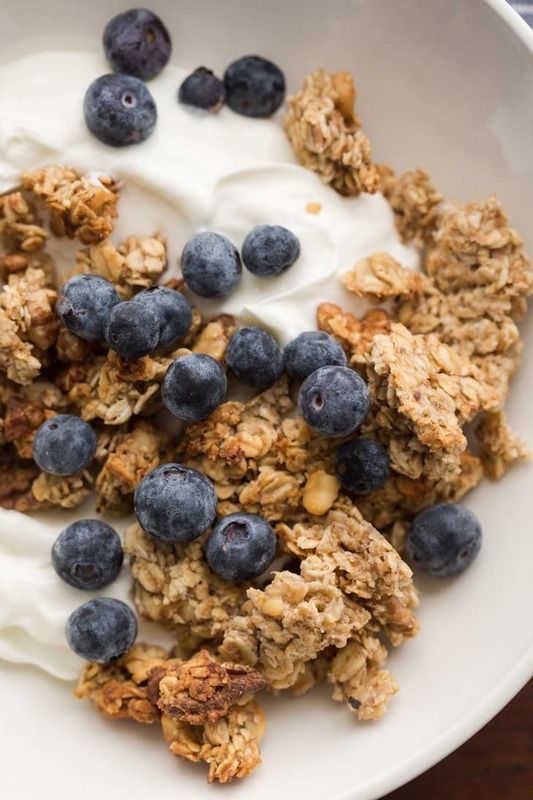 Granola is most definitely my favorite yogurt topping. Just made a half batch of these using sunflower seeds instead of walnuts and it tastes great! I think I may have measured a bit too much oats, though, and am going to try a slightly higher banana-to-oat ratio next time to get a texture like yours. Mine also browned a TON (like, too much) but I think that is probably moreso my attention span than anything! Question, though: do you have any storage recommendations/how long do you think these babies will last? 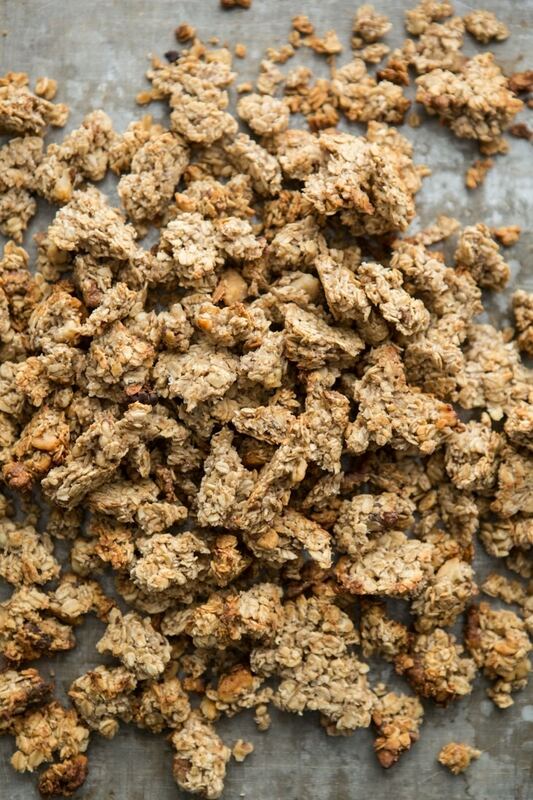 I’m in university and am the only one eating this granola, and would love to make a huge batch of it, but don’t want it to go bad! Currently I’m keeping my small batch in a mason jar in the fridge? Do you have any other ideas to keep it lasting as long as possible?